It is rainy season in my hometown "Nagercoil".I was out on a shopping spree and I made the big mistake of not carrying an Umbrella with me. The rain started to pour and hence I was waiting under the shelter in front of the supermarket. That is when, She caught my attention. She must have been 6 years old, this beautiful short hair,pink-face Image of innocence. Her Mom looked like someone with a heavy heart. Not that she was old. She looked like a Mom. It was pouring outside. The kind of rain that gushes over the tops of raingutters, so much in a hurry to hit the Earth it has no time to flow downthe spout. Drains in the nearby parking lot were filled to capacity and some were blocked so that huge puddles made lakes around parked cars. We all stood there under the awning and just inside the door of supermarket. We waited, some patiently, others irritated because nature messed up their hurried day. I am always mesmerized by rain fall. I get lost in the sound and sight of the heavens washing away the dirt and dust of the world. Memories of running, splashing so carefree as a child come pouring in as a welcome reprieve from the worries of my day. Her voice was so sweet as it broke the hypnotic trance we were all caught in. "Mom, let's run through the rain," she said."What?" Mom asked. "Let's run through the rain!" she repeated. "No, honey. We'll wait until it slows down a bit," Mom replied.This young child waited about another minute and repeated her statement."Mom. Let's run through the rain. ""We'll get soaked if we do," Mom said. "No, we won't, Mom. That's not what you said this morning," the young girl said as she tugged at her Mom's arm. "This morning? When did I say we could run through the rain and not get wet?" "Don't you remember? When you were talking to Daddy about his cancer,you said, "If God can get us through this, He can get us through anything!" The entire crowd stopped dead silent. I swear you couldn't hear anything but the rain. We all stood silently. No one came or left in the next few minutes. Her Mom paused and thought for a moment about what she would say.Now some would laugh it off and scold her for being silly. Some might even ignore what was said. But this was a moment of affirmation in a young child's life. A time when innocent trust can be nurtured so that it will bloom into faith. "Honey, you are absolutely right. Let's run through the rain. If God lets us get wet, well maybe we just needed washing," Mom said. Then off they ran. We all stood watching, smiling and laughing as they darted past the cars and yes through the puddles. They held their shopping bags over their heads just in case. They got soaked. But they were followed by a few believers who screamed and laughed like children all the way to their cars. Perhaps inspired by their faith and trust. Many ran that night.But only two people will share that precious moment when they ran through the rain believing that God would get them through. And Yes, I did. I ran too. I got wet. I needed washing. "If God can get us through this ,he can get us through anything"
This is a very touching post with a wonderful message! However, Im not sure if it's God that gets us thru our toughest times...I believe its our own strong willpower. 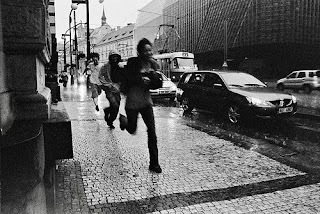 Just like how they ran in the rain...cos there was a Will to do it. I guess thats says it all. But a really beautiful post Chriss! God surely gets us through in the tough times.. that will power that we have is not ours. its provided by god..
innocent words from kids can sometimes be so strong and thought provoking..
Whoa ! That was amazing !! I always love your offbeat non-funny, serious posts ! They never fail to make you happy ! Nice post!! Was smiling in the end!! waaaa no... awwwww... u don undershtand??? wowie god was my expression...kids erhh..
Amazing post...i just wish we dint become so complicated as we grew up...children are soo carefree and true! i got washed in that :) soaked n cleansed.. If God is giving us that power in us, why isnt it equally distributed to everyone? i know... you and your lovely thoughts.. same innocent thoughst here too.. But he gives different talents to each one of us..
we use our earthly mind and measures and come to a conclusion that one talent is more worthy than the other.. Most of us find the talents and execute.. Most of us never take the next step..
**Most of us find the talents and execute.. Most of us never take the next step..
**God wants us to strive and try and not be so very lazy.. So if we are to TRY, then in the end it's our own WILL POWER isnt it? thanks for blogrolling.. will hop down to ur page and visit ya. thank ya..
the approach was different in how we take it..
Ahh... mon Cheri... though a good inspirational piece i have lost my ability to believe in these things... i'm not a cynic but might as well have been.